Renee Shearer writes young adult fiction under the name of C.J. Hart. Renee is a full-time writer who lives in Sydney, Australia, with a crazy pooch named Abbey and a boisterous, somersaulting rescue budgie named Kaleb. Her days are spent living in her fictional worlds and consuming way too much caffeine. She has an (unhealthy?) obsession with all things cupcake- and coffee-related plus Kerouac and YA dystopia/fantasy books. RenEe can often be found surrounded by books, marathoning crime shows and munching on vegan goodies, on Twitter (@Renee_Shearer), Pinterest, or dancing in a rainstorm. RenEe hopes to one day visit Rio and is currently learning Brazilian Portuguese. I was given a copy of this book in exchange for an honest review. Although this book is not in my usual scope of genre, I do enjoy a good paranormal based novel and I did enjoy this book. Overall, the book kept me interested in the plot line and I had that urge to read the whole book through (which is a good sign). The character development was good but I felt I needed to know more. But I still enjoyed it and would recommend it for those interested in the Teen/ Young Adult Paranormal genre. So, we are back to the self-absorbed Cass who gets on my last nerve. 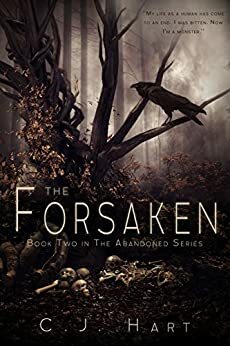 The weirdly written, murderous skinwalkers and the hunters who clean up their mess. The whole time I am thinking put a silver bullet in the psychopath's, Ash, brain and the murdering and eating of humans will stop. That whole aspect of skinwalker's need to eat humans is disgusting and not needed. Any sane person(talking about Cass) would not just go off with one and in a matter of days be in love(from first book). Cass has murdered and eaten some one, but it is OK because he was homeless (heavy sarcasm). Ash is still killing and eating people. Seb is dealing with Cass's self-absorbed self. There again the hunters are doing the clean up of the skinwalkers mainly Ash and his crew. Book ends on a cliff hanger. 2.0 out of 5 starsWhere's the rest??? Loved the book, I really did but I'm tired of waiting around for the next book. If you don't plan write the next book in the near future... Then PLEASE don't leave the book on a cliffhanger. I have waited a year for the new book and still... Nothing, not even a mention of a new book. It was my favorite but not anymore. Don't hate me but REALLY??? I guess I'm just frustrated. Book 2 in the Abandoned Series with Cass and Seb. Ash turned Cassie and she is having difficulties with the transitioning into a wolf. She is even having times when she blacks out. Cass is terrified she is becoming a monster that she has no control over and is having difficulties telling Seb what she is feeling. Ash continues to haunt the group and they do not know what he is planning. Nor can anyone figure out what this strange illness Cass contracted or how to cure her. Cass is also dealing with living out of her father's house and starting college. Cass is maturing and must learn to open up to those around her. They cannot help her if she does not tell them what she is feeling or how to help her. Kat and Sike are there to help Seb and Cass. Great second book in this paranormal teen series. I received an eARC via Clean Teen Publishing Elite Reviewers which I am a member of. I made no guarantee of a favorable review and the opinions expressed here are unbiased and my own. This second book is well paced and the storyline and characters are strong. Cassie is having problems with transitioning and is seeking revenge for her best friend. I enjoyed this book even more than the first and cannot wait to see what the third one will bring. Great continuation to The Hunted!!! But now I can't wait til book 3!!! !